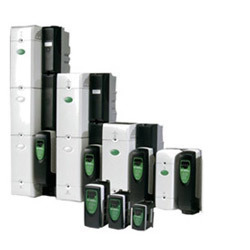 General purpose complete range of HVAC drive ranging from 0.25 kw - 132 kw (0.33HP - 200 HP) 100 V / 200 V / 400 / 575 / 690 V.
VDF as a standard include for 4DI,1DI / DO, 1DO, 2AI and 1 AO. Established in the year 2003 at Mumbai, (Maharashtra, India), we “Kahan Controls” are a Sole Proprietorship entity and one of the distinguished Traders, Wholesalers, Importers, Exporters and Suppliers of a huge gamut of RRefrigeration Controller, Data Logger, Electrical Panel, Leak Detection System, Air Conditioning Controller And Instrument, Humidification System, Gas Analyzers, Digital Temperature Controller, etc. Under the guidance of “Mr. Virendra Kamdar (CEO)”, we have been able to maintain our leading position in the industry. We export these products to Europe and Gulf countries. We deal with some reputed brands such as Dixell from Italy, Regin from Sweden, Pego from Italy, Murco from Ireland, Tecnlocooling from Italy, Fuji from Japan, Saginomiya from Japan, AKO from Spain, Emerson from USA, Devatec from france, etc.